You will Watch Star Wars Rebels Season 3 Episode 6 online for free episodes with HQ / high quality. Stream cartoons Star Wars Rebels Episode 43 Sabine continues to try to convince Fenn Rau to have his Protectors formally join the Rebellion, but Fenn remains staunchly loyal to Mandalore. When contact with the Protectors is lost, Sabine, Ezra, and Chopper are sent with Fenn to investigate. However, when they arrive, they find the Protectors base completely destroyed. After they destroy an Imperial probe droid, a squad of Imperial Mandalorians led by Gar Saxon arrive to investigate. 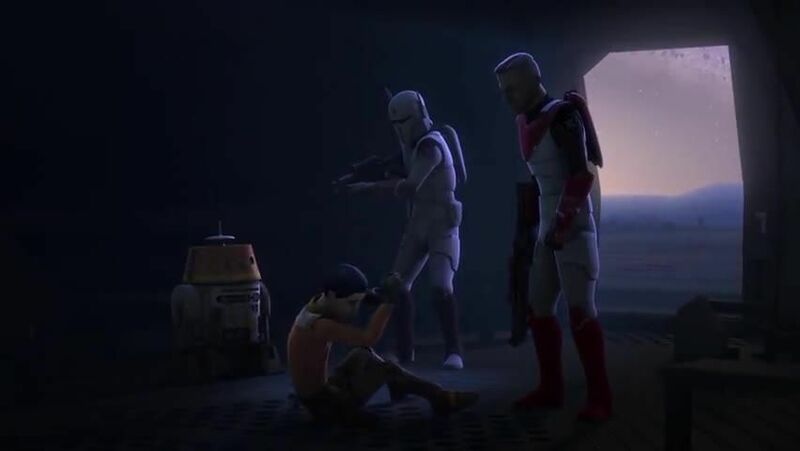 Ezra and Chopper are captured while Sabine and Fenn manage to escape. While spying on Gar, Fenn realizes that the Empire intended to destroy him and the Protectors all along, and he decides to join forces with Sabine. Sabine rescues Ezra and Chopper, but Fenn seemingly betrays them when he takes their shuttle and escapes without them. Gar explains how Sabine’s defection to the Empire caused disgrace to her family, who have now pledged their allegiance to the Empire. Sabine, Ezra, and Chopper try to flee from Gar and his men, and are assisted by Fenn who helps them escape, but not before Sabine defeats Gar in hand to hand combat. Fenn, impressed by Sabine’s loyalty to the Rebellion and her friends, decides to officially join the Rebellion.